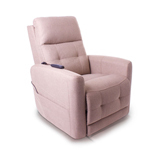 For people who have difficulty in getting in and out of conventional furniture, to have their own 'Lift & Rise' recliner makes a huge difference to their freedom and quality of life. A generous side pocket is fitted to house your choice of Single or Dual Motor mechanism handset, which can also be specified for left-handed use. 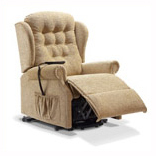 Supplied with castors for ease of movement. Special NEXT WORKING DAY DELIVERY option is available on selected fabrics and at an additional charge. Comprehensive fabric choice. 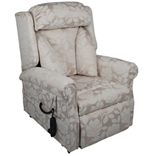 Pride´s dual motor The Westminster features powered lumbar support and unique power positioning headrest. The supportive, fibre filled pillow back with removable panels provide superb comfort and the velcro attachments allow for individual adjustments to be made. The filling can be personalised to meet the customer´s specific requirements, as the panels have zipped access.